Digital signage is hitting its stride. Our survey of 1,000+ executives says where it’s going, with more than 70 charts to help you keep up. With bonus offers and introductory discount. This comprehensive statistical look at the trends and attitudes affecting digital signage today is a must-read for deployers and providers alike who want to keep up with competition and speed up ROI. 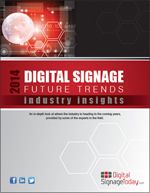 The 35-page downloadable 2014 Digital Signage Future Trends Report contains the full results of our exclusive survey of over 1,000 deployers and hardware/software/service providers in the dynamic digital signage industry.